With the upcoming deprecation of Google’s DSM in 2019, many publishers are starting their search for a new order management system. Although every business has its own unique quirks, every publisher has a few consistent requirements. Their next OMS needs to satisfy the needs of Sales, Ad Ops and Finance departments; integrate with DoubleClick; and offer simple, elegant migration of the company’s historical data and product catalog. Some multiplatform publishers have to consider their exceptionally complex business structures or product portfolios when they consider new software. Take the example of ALM. This multiplatform B2B publisher has multiple sales teams generating revenue across a wide-ranging portfolio of publications, events, and marketing services. As ALM added more products and moved into new markets, basic operations like managing inventory, it was exponentially more challenging for its centralized ad operations team to execute orders and invoice clients. Chief Digital Officer Dave Saabye knew that ALM’s processes had to be simplified for the company to scale and achieve its growth targets. It needed workflows and systems to decrease time spent on managing complex sales incorporating sponsorships, services, and digital and print units. That’s exactly the idea behind WO Digital Hub. 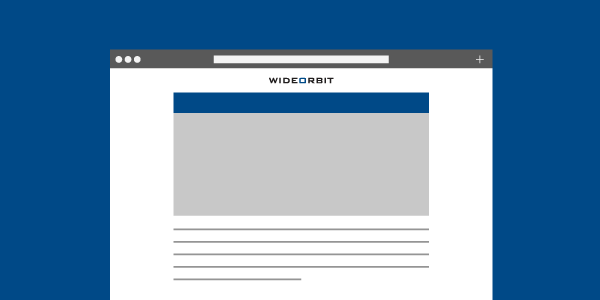 WideOrbit’s order management system is tailored to accommodate the business requirements of publishers with multiple properties, sales teams, and advertising products. “WO Digital Hub has the flexibility to accommodate any reasonable business requirement,” Saabye said. Our implementation team collaborated with Saabye and ALM department leads to integrate WO Digital Hub with many of ALM’s key systems – everything from CRM and accounting databases to email and ad servers. Read our case study to find out how we did it. Contact us to find out how we help publishers like ALM take control of their advertising business, manage inventory and account for success.